Craine, Thompson and Jones, P.C. is a full-service CPA firm located in Morristown, and Sevierville, Tennessee, serving the East Tennessee region. The firm was founded by Hiram H. Jones in September 1960 as Hiram H. Jones Associates. In 2002, Hiram H. Jones Associates, P.C. merged with Glenn Thompson, CPA to form Craine, Thompson and Jones, P.C. Hiram H. Jones opened the original office in the Kingmyer Hotel building in 1960. 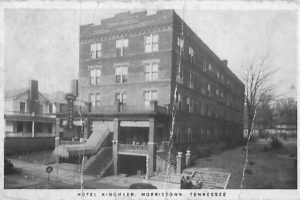 The Kingmyer Hotel was a local landmark which housed many influential guests and provided office space to a variety of local businesses including the Morristown Area Chamber of Commerce. Over the years, the Kingmyer became in disrepair, and the CPA firm relocated to an office across the street. It became the dream of James W. Craine (an owner in the CPA firm) to construct an office building on the original site of the Kingmyer. In 2002, Millennium Square Partners constructed a three-story office complex on the Kingmyer site, and Craine, Thompson and Jones, P.C. became the first tenant in the building.